You can identify old or antique glassware even before a trip to the appraiser by studying up on a few popular glass and dinnerware genres of the late 1800s through 1950s. Many of these patterns may cause you to have an "A-ha" moment as you recall similar glassware from a friend or relative's cupboard. 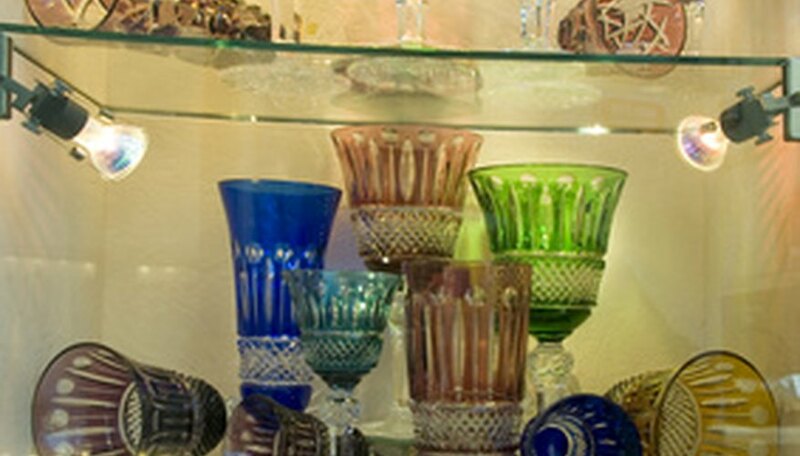 From thin and lightly colored glassware manufactured during the Depression to creative Art Nouveau designs, consider the many variations on antique and vintage glassware. Identify Fostoria glass by its thin consistency. Fostoria glassware, often issued as part of a set, was pressed or molded into translucent color pieces, often implementing a bumpy or cube design. Look for etchings, as they were a common design element on Fostoria candy dishes, candleholders and vases and tableware. Use a magnifying glass to check for pale lines from the mold, or remnants of a paper label. Fostoria tableware was heavily produced from the late 1800s through the Depression, and can be located easily in antique stores, flea markets and auction sites. Pinpoint Carnival glass by its rainbow pattern. Carnival glass, manufactured in the United States by the Fenton Art Glass Company of West Virginia, used a method similar to Fostoria Glass. Fenton developed a procedure that involved exposed pressed glass to fumes emitted by hot metal oxides. This resulted in glass with a rainbow surface, or the appearance of different colors caused by the way light falls on the glass. Recognize old Art Nouveau glass by its abstract shapes. Designed in wavy or twisty patterns by Tiffany, the Daum brothers and Galle, these highly individualized pieces were often made out of iridescent glass, which takes on a rainbow hue when held up to light. Art Nouveau glasses often emitted a metallic tinge, and many glass art items made in this style were a combination of glass and metal. Look for Depression-era glass. Tableware and dinnerware sets produced cheaply and in great quantity during the 1920s and 1930s, these thin, colored translucent pieces came in several popular patterns. There’s the self-explanatory Bubble pattern, the pink “Holiday” that resembled tiny bows embedded in the glass, the Horseshoe design, and as many as a hundred other motifs manufactured by Anchor-Hocking, Fenton, Economy, Jenkins, Indiana Glass Company and others.